The Current Agency, which calls itself a one-stop digital and creative marketing company, boasts 6,600 square feet of work, play and mostly emptiness in the name of collaboration and chic. You’re an employee, and you want to relax a little? Have a seat on the sofa. Want to unwind? Play a little basketball in an adjoining events space. Want to regenerate? Take your work to a table outside. 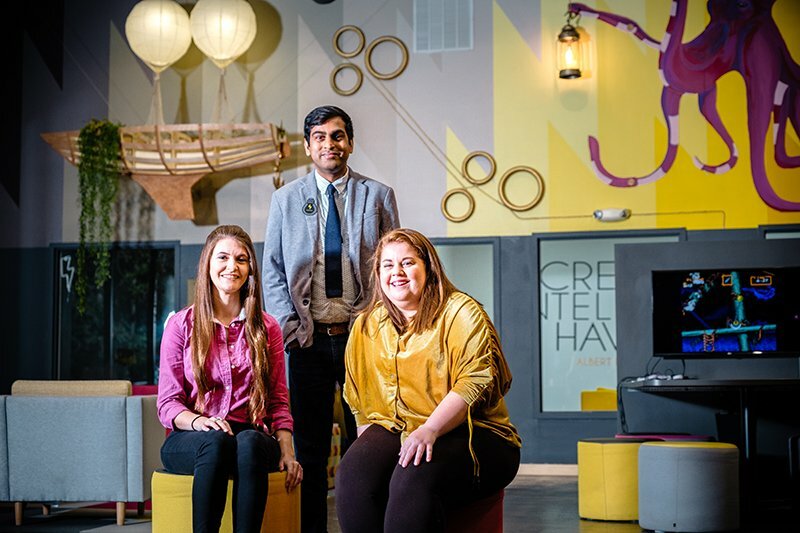 The former thrift store east of Capital Circle on Apalachee Parkway has become a playground — better yet, a proving ground — of sorts for Shah, a 2012 Floirida State University graduate, who majored in marketing. Shah, 29, said his parents had urged him to take over the family hotel business in Marianna, where he attended high school. He said his parents came to the U.S. from India with little education and little money, but they succeeded in building businesses throughout the Panhandle. He thinks he’s on his way. The Current Agency, which got its start in early 2014 as CPS23 Marketing, in early August sported four full-time employees and about 20 clients, Shah said. Among its clients are Capital City Music Therapy and Who We Play For, a nonprofit organization that aims to eliminate preventable sudden cardiac death in young people. Current says it works to, among other things, increase clients’ traffic and promote their brands through services in design, photography, video, social media and public relations. Shah launched CPS23 Marketing more than four years ago after an internship with Tallahassee’s Next Level Baseball, which provides experienced instruction for young players. As his internship ended, he said, he told Next Level founder Ryan Robinson that he was starting his own business. “And as I was walking out, he said, ‘Chirag, wait. Can I be your first client?’ ” Shah said. Focusing his business on websites and social media, Shah reconnected with friend Savannah Swindle, who had attended Holmes County High School in Bonifay, not far from Marianna. She at the time attended the Savannah College of Art and Design. Swindle said she suggested that the company offer a creative-design component and agreed to help build the company without pay, as startup workers often do in such “bootstrap” situations. They went from working out of their homes to working in coffee shops before they landed in a 1,200-square-foot space off Capital Circle Northeast. Yet they wondered about their name. They found that clients were having trouble keeping track of three letters — Shah’s initials — and two numbers. So they turned to the light bulb image that they had used in their marketing and settled last year on The Current Agency. At The Current Agency, that theme burns brightly. Its new light bulb logo beams above its new building entrance. Its website asks potential clients: “Can we turn you on?” And when drained employees head to the hoop, they get a charge not from a game of H-O-R-S-E, but W-A-T-T.
“And whoever wins, we run with that employee’s idea,” Shah said. Current’s new building features a 3,800-square-foot events space that the company calls “The Watt Factory,” which includes the basketball hoop and an area for rest, collaboration and additional play. Shah said he envisioned it as a spot for yoga, workouts and music therapy, even company retreats. The Current Agency thereby follows Silicon Valley, where open workspaces became a hit several years ago and spread nationwide for their promise of communication, teamwork and stress-reduction. Some studies and reports suggest that because of noise, distractions and lack of privacy, they promote the opposite effects and that they’re on their way out. Not so here, The Current Agency insists. “It’s definitely a collaborative environment because it’s so open and we can work wherever we feel comfortable,” said graphic designer Jessica Sizemore. That goes for playing, too.